Yoga is practice that can not only transform bodies, but also minds. In some cases, it even transforms lives. For Rich Gonshak, it did all of the above. He actually happened upon yoga while in the Judo program at North Eastern Illinois University. His newfound yoga practice slowly brought him to places of awakenings, showing him what was right in his life and what was not so right. As Rich’s practice grew, so did his quest to learn more, to do more and to become more. Rich soon discovered a few yoga studios where he could trade for work. In the process, Rajeev Kahn taught him Anusara Yoga at Moksha Yoga and then directed him to Geri Bleier at Yogaview, where he practiced with Geri for over 10 years. At the time, she was the only certified Anusara Yoga teacher in Chicago. All modules are separate, students and Yoga Instructors are welcome to register for as many of as you can. Similar to the style of Anusara Yoga with its loops and spirals of energy, Gokul Hatha Yoga is a scientific approach. 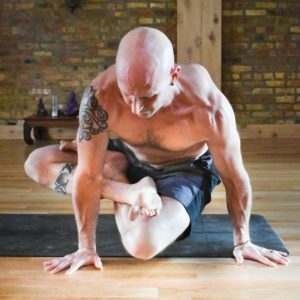 In this series of workshops, Rich will help us look at each pose as an experiment.